The Summer Undergraduate Program in Eye Research: 15th Annual Symposium is coming up on July 31, 2015. 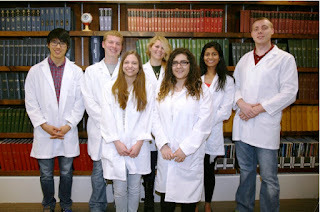 Another seven OU undergraduate bioscience students will be presenting talks on their summer research experiences here in the Eye Research Institute of Oakland University. 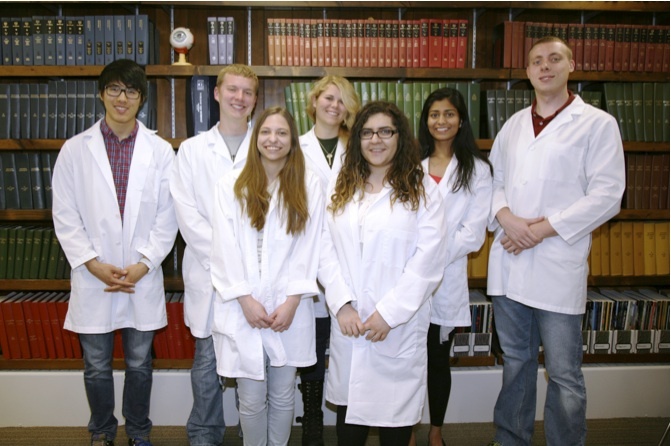 While this is year 15 for the formal SUPER program, OU and other Michigan college and high school students have been training in the ERI ever since our institute was founded by Dr Kinsey over 40 years ago. SUPER program alumni achieve an extremely high participation rate in entering professional and graduate schools. Recent SUPER students from past years continue to move along in their training and careers in graduate school, medical school, dental school and optometry school. For example, SUPER alum Mary Cha (US Army active reserve) has served as a medic in Afganistan and is starting medical school at MSU this fall. Trung Tran has obtained a Masters degree in public health from Washington University and is starting medical school at Wayne State this fall. SUPER scholars work on real research projects in ERI laboratories and most will obtain co-authorships at some point on research publications from our labs. Scholars have applied for the program in the past winter term, maintain a minimum GPA, write an application essay, and go through interview with ERI faculty. The seven SUPER students this summer also had a $3,500 paid scholarship for the 12 week program. Students also received a basic science or clinical ophthalmology lecture from ERI and Beaumont Ophthalmology faculty each week. We thank all those who support the program with funding, including the ERI itself, OU’s Provost Office (Dr Lentini), OU’s Center for Biomedical Research (Dr Brad Roth), the Vision Research ROPARD Foundation and Richard Skipper, President and CEO of SKIHI Enterprises in Fort Worth, Texas. Together we are all training future leaders, scientists, engineers and medical professionals. Does Peripherin-2/rds (P/rds) shape membranes using disulfide bonds? Michigan Cuts State's Share of University Student's Education Costs, then some Politicians Blame Universities for Tuition Increases. So far, Wayne State University, Eastern Michigan University and now Oakland University are the first of Michigan's public universities to dare to increase tuition above the Michigan State Government's tuition cap. Breaking this cap results in a penalty through the loss of a portion of the State's funding support. However, these universities gain more funding through the tuition increases. Of course, sure enough, I hear sound-bites on the radio from State appropriation committee members suggesting that they add more teeth to penalize these universities further for raising tuition far more than the rate of inflation. Universities, in this State and around the country are accused of gouging students and wasting money. However, what these same politicians fail to mention is that they have also spent the last 20 years dramatically decreasing the State's percentage contribution to our student's education costs. As a matter of fact, in 2015, Michigan contributes a tiny 16% of an Oakland University student's education cost, compared to the early 1980s when Michigan contributed around 70% of a student's education cost. Your kid's and my kid's college tuition has increased more than the US inflation rate since 1980, but that is not a correct comparison. The education costs of a student at Oakland University has only increased the same as inflation since 1980. So why has the tuition component grown faster than inflation? Because, our State has dramatically decreased its contribution the education costs pie. If you want to see the numbers, and you like facts more than ideology, read on.